This presentation provides an overview of the threats against a wide range of organizations and individuals during 2016. This overview is based on research and analysis conducted by the Webroot Threat Research team. The report includes analysis of top ransomware variants, details on the changes to exploit kits, phishing detection statistics, insights into file reputation and encounter rates with malware and new information on the IoT environment. All data presented comes from Webroot’s Intelligence Network and was observed during 2016. 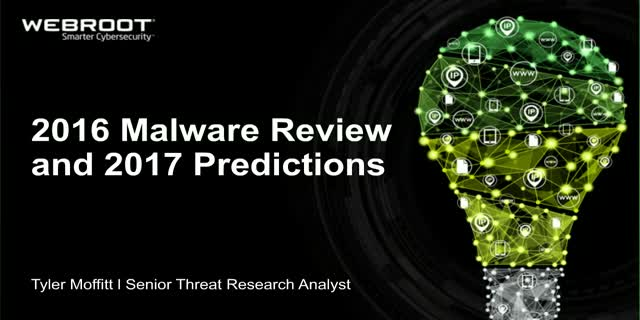 We will also be looking forward into 2017 and making our predictions regarding the evolving threat landscape. SMBs are major targets for cybercriminals. To stay safe, today’s businesses must understand the different types of cyberattacks they may encounter and implement strong cybersecurity practices. Register for this 30-minute webinar on the key threats businesses faced during 2019 and what's upcoming in 2020 to get details and tips that will help you to keep your business and clients safe. Our Threat expert will be discussing information theft, information stealers, BEC scams, ransomware, targeted attacks and all the criminal news of the year. This webinar will provide expert insights on the latest cybercriminal activity and recognise the year's most innovative, dangerous, and pervasive malware. Specifically, we will be covering the latest developments and providing updates on Information theft, Emotet, BEC scams, Ransomware, targeted attacks. Join our 30-minute webinar to about these developments and strategies to help secure your organisation from ransomware and next-generation cyber threats. Cybercriminals keep on finding ways to attack businesses no matter how big or small they are. When we see HTTPS at the beginning of a URL or the accompanying lock icon in our browser’s address bar, we’ve been conditioned to think that means we’re safe from harm. But HTTPS isn’t really about security, it’s about privacy. That lock icon just means that any information we transmit on that site is encrypted and securely delivered to its destination. It makes no guarantees that the destination itself, is safe. Cybercriminals know we’re all trained to look for the lock icon in the address bar, and have been working hard to take advantage of our trust. Join our 30 minute webinar to find out about the trade-offs between privacy and security, and whether HTTPS is really as secure as we think.